Metal with wood harmonica. Assorted colors and styles. 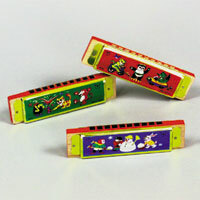 4 inch harmonicas. $4.70 per dozen for 36 dozen or more. $4.15 per dozen for 72 dozen or more.